Green-edged acrylic gives the impression of glass. 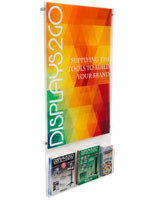 Dual graphic frame and brochure rack is perfect when wall space is limited for advertisements. 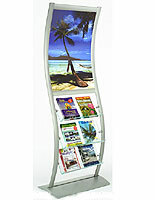 This publication stand has a unique, wave-like design to help draw customers to your display. The image display, publication stand features an 18"w x 24"h graphic frame and (3) brochure pockets constructed from green-edged acrylic. 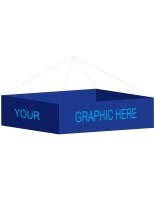 The sign holder will grab an audience's attention while your pamphlets will leave a lasting impression upon them. 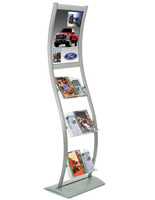 This publication stand is constructed from aluminum for a rust-resistant, yet sleek display. 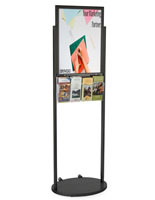 This publication stand is a combination of a literature holder and a sign frame. 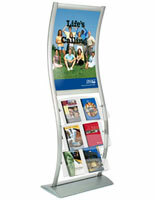 This publication stand, also known as an information kiosk, is perfect for retail stores, hotel lobbies or office entryways. You can use the acrylic pockets to distribute store flyers or to hand out informational literature to visitors. 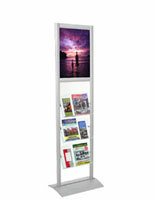 This image panel is a double-sided publication stand, users can access from multiple directions. 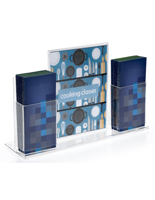 We even provide the publication stand with (2) clear lenses to keep your graphics in place and protected. This sign rack, publication stand also features adjustable brackets for changing the height and angle of each literature pocket. The publication stand, such as our other wave-shaped fixtures, has an attention-getting design to make your advertisements and flyers stand out! Please Note: Graphic is not included with display frame. When designing your images, keep in mind the actual graphic size is 18"w x 24"h, where approximately 1/2" on each side is covered. Your graphics should be printed on regular poster paper, so as to ensure they will fit securely within the grooves. This will not be a problem for any printing service facility. 18.0" x 74.5" x 16.0"